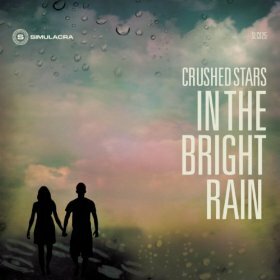 Soothing, consoling, settling, and soft are all words that can describe the classic shoegaze sound of Crushed Stars’ newest release In The Bright Rain. Believe me, I know. Shoving earbuds into my ears after a busy, stressful day to listen to this album, tension and worries were quite instantly whisked away and I was transformed into the picture of peace and relaxation. The music visionary behind Crushed Stars is Todd Gautreau. His talent as a multi-instrumentalist takes away the feel of collaboration and replaces it with intricately arranged, simply orchestrated harmonics and melodies. This 9-track effort transports you to a hypnotic soundscape for just over 30 minutes. With eyes closed and everything still, it’s rewarding to ride the gentle wave of Gautreau’s abysmal yet rooted vocals with careful guitar riffs and calculated strumming as worthy companions. Carrying the dream theme even further are the titles of these tracks such as “Bedtime For Dreamers,” “Color Kites,” and “Take Flight.” The surface hugger on the album is the single “Brighter Now.” It’s got a dream pop sound that somewhat deceives the feel of the rest of the album. Rest assured that depth is easily reached with the remaining 8 tracks.